See it at Cine Gear! The all new GY-HC500U handheld 4K production camcorder offers uncompromised live and recorded image quality and connectivity. PRE-ORDER yours before June 30, 2019, and receive a free 1TB SSD memory card and KA-MC100G SSD media adapter required for ProRes recording—a $675 retail value. Shoot practically any way you choose! Shoot 4K ultra-HD with HDR and record to SSD or SHC/SDXC media in a wide variety of formats. Or, when recording to SSD, Ultra-HD ProRes 422 10-bit at 50/60p is possible. This Connected Cam series camera also features high performance 1080 60p/50p live streaming with low latency and a full complement of IP remote control and viewing features making it the most advanced and versatile camcorder in its class. PROMOTION: Receive a FREE KA-MC100G media adapter and FREE 1TB SSD drive for each new GY-HC500U you purchase between April 1, 2019 and June 30, 2019. There are no forms to fill out! At the time of purchase, inform your dealer that you wish to receive a free media adapter (KA-MC100G) and free 1TB SSD drive with your qualifying camcorder purchase. 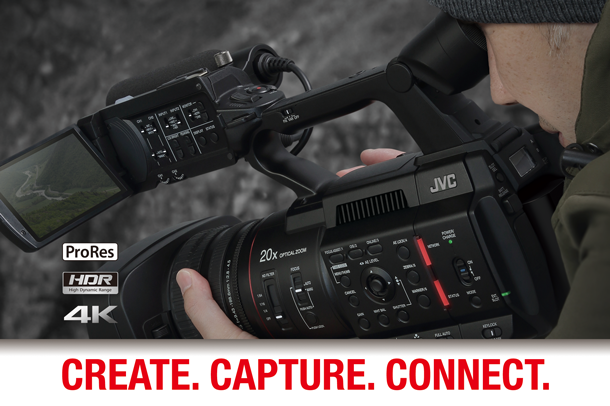 Your only obligation as the buyer is to ensure your dealer is an authorized and participating U.S. JVC reseller. You must place an order for a new GY-HC500U from an authorized and participating JVC Professional products United States reseller on or before 6/30/2019. JVC will provide the promotional merchandise to the authorized and participating reseller, and not directly to the end user. Your participating reseller may have additional terms and conditions. Promotional merchandise subject to availability. JVC reserves the right to cancel or modify this promotion at any time.